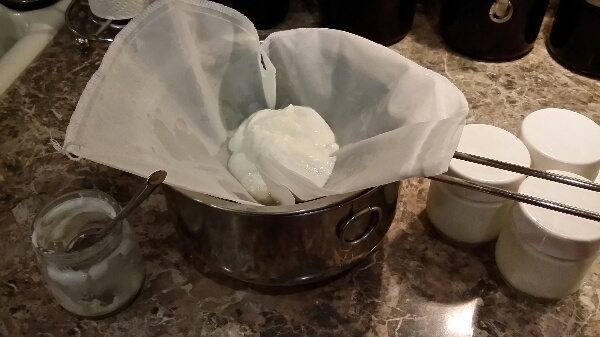 We make our yogurt quite often, but you can do this with store bought yogurt as well. 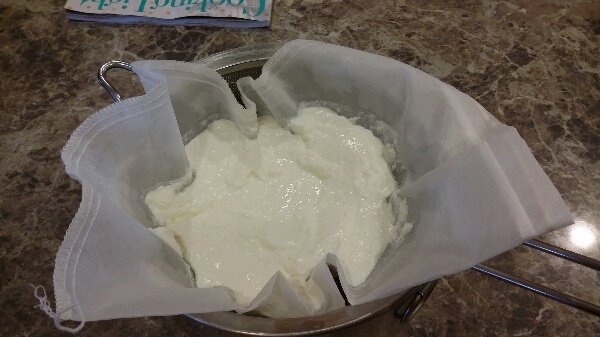 Line a paper towel or cheese cloth over a large sieve. Set the sieve in as large bowl. Pour the yogurt into the lined sieve and set back into the fridge. Let sit for at least 2 hours. The longer you let it sit, the thicker it will become. The “water” that drains off will be greenish. This is the whey. You can use it in smoothies if you wish, but I usually end up throwing it away. The remaining yogurt I put into a container and cover. This can be used in many different ways. Dressings, dips, replacing sour cream… or just eaten as is with a little honey or jam.